PRINCESS ANNE, M.D. 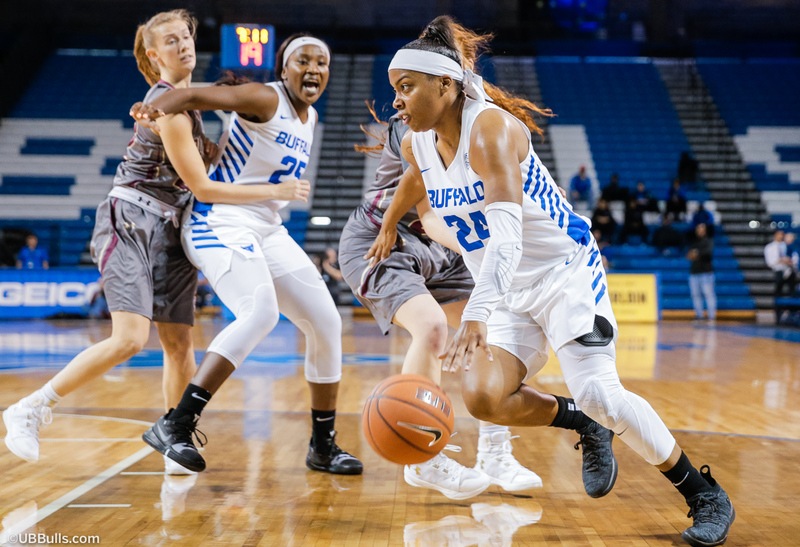 -- The University at Buffalo women's basketball team (1-0, 0-0 MAC) earned a season-opening road victory on Sunday night against Maryland Eastern Shore, 69-63. Senior guard Cierra Dillard led the way for the Bulls with a game-high 23 points as she netted a career-high 13 free throws including six clutch freebies down the stretch to put the game on ice. After the Shore cut the UB lead to just three, 63-60, with under a minute to play, Dillard calmly stepped to the line on three occasions and netted both free throws to secure the win for the Bulls. Dillard finished off her impressive night going 13-for-18 from the charity stripe while finishing with 23 points, four rebounds, four assists and two steals across 40 minutes of work. Senior Courtney Wilkins had a strong game for Buffalo as she finished with 15 points while draining three triples in the win. Off the bench, Brittany Morrison scored eight points and grabbed a team-high six boards in 22 minutes. After the Hawks opened up the scoring with a layup, Cierra Dillard got things going for the Bulls as she netted a deep triple and made a free throw to give the Bulls the early 4-2 lead. The Hawks regained the 5-4 lead but UB answered once again with a 9-0 run as Dillard netted another deep triple and Courtney Wilkins finished off a fast break layup after a feed from Marissa Hamilton. Theresa Onwuka made a pair of free throws and earned a steal and fast break layup before Wilkins drilled a triple to end the first quarter scoring for UB as they held the 20-12 lead through 10 minutes. The Bulls were able to extend the lead out to 11 early on in the second quarter as Oceane Kounkou finished off her first career bucket after a great feed from Hanna Hall. Kounkou then notched a jumper to make the score 25-14 with eight minutes left in the first half. After the Hawks netted a triple, Dillard took over the next two minutes as she scored six straight for the Bulls while causing a pair of turnovers to extend the UB lead to 13. The two teams struggled with turnovers down the stretch of the first half and Hamilton capped the scoring with a free throw to give the Bulls the 34-25 halftime lead over the Hawks. The third quarter was a back-and-forth affair as the Bulls were able to extend their lead through 30 minutes to 10, 49-39, as they outscored the Hawks 15-14. Onwuka opened the scoring in the quarter for UB as she made a nice move and finished off a layup before Wilkins netted a triple to give UB the 39-30 lead. The Hawks finished off a layup but Buffalo responded with six straight points to extend the lead to 45-32 as Morrison snagged an offensive rebound and layup and Finess Dickson finished off a steal and layup to give the Bulls some momentum. The Hawks netted a three and some free throws down the stretch as UB held the 10-point lead, 49-39. Buffalo opened things up early on in the fourth quarter as Adebola Adeyeye finished off a layup after a great feed from Dillard and Wilkins and Hall drained back-to-back triples to make the score 59-45 in favor of the Bulls. The Shore then started to climb back into the game as they went on a 10-0 run to cut the UB lead down to 59-55. Dillard was able to sink a free throw and Morrison forced a travel to get the ball back into the Bulls hands and Wilkins connected on a big three-pointer to extend the UB lead to 63-55 with just over a minute left. The Hawks tried to get back into the game with a deep triple but Dillard sank six free throws down the stretch to ice the game for UB. As a team, Buffalo was able to shoot 42.6% from the floor and 30.4% from behind the arc while holding the Hawks to just 38.9% from the floor. The Buffalo defense had a strong showing as they were able to force 23 turnovers and they turned those into 28 points. Both teams had 22 points in the paint while the Hawks held the 35-29 edge in rebounds in the game. The Bulls will return to Alumni Arena on Wednesday evening as they welcome Big 4 foe Niagara for a 7:00 pm tip. Prior to Wednesday's game, the Bulls will honor their 2017-18 Sweet 16 team as they unveil a banner inside Alumni Arena.